This pre-wired and tested Radian Inverter System is unique to the renewable energy market because it combines both off-grid and grid-tie capabilities into one piece of equipment. As with any grid-tied system, it will allow you to sell excess power that your solar panels generate back to the utility company, but you’ll also have the added security of battery backup in an emergency. The GS4084A inverters from OutBack stand above older models by incorporating Grid-Zero technology, which allows users to decide when to use power from the batteries and when to buy power from the grid. By using battery power during more expensive times of the day users can save even more money. Not applicable in all areas. Protects you from utility power outages. Gives you a return on your investment with its grid-tied net-metering capabilities (in areas where grid-tied power and net metering programs are available). Is expandable. 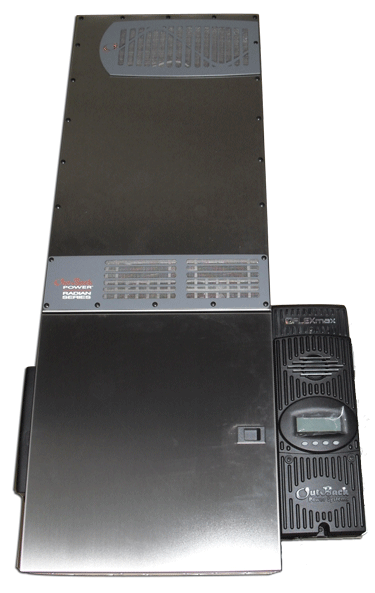 Up to 10 Radian Inverters can be connected in parallel for up to 40,000 watts of power. Gives you the choice of starting out with an “off-grid” system with the option of utilizing its grid-tied capabilities, if a utility company becomes accessible, or vice versa. Is simple, easy and safe to install. Call us at (1-800-472-1142) to find out if this solar power system is right for you. Wholesale Solar will custom design any system to match your particular application. This power center now comes with a full 5-Year Warranty on parts and labor. Clearly labeled connection points for AC and DC input and output. Fully assembled and tested by experienced factory trained technicians. All required internal cables, connectors, brackets, and breakers. Will take power from solar panels, wind power, or generators. A safe 100% NEC compliant design. 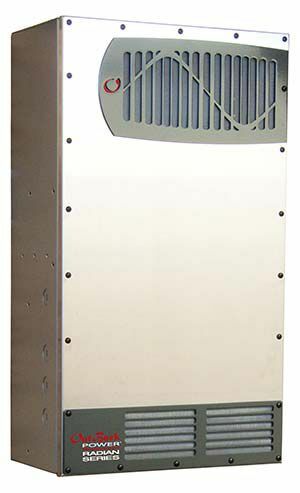 Ability to expand up to 40,000 watts. Load Center: 17" X 16" X 8 1/2"